The report is meant to be useful to clean energy advocates by providing information about California’s renewable energy requirements and the use of RECs to meet them. The information is relevant to other states, as well. 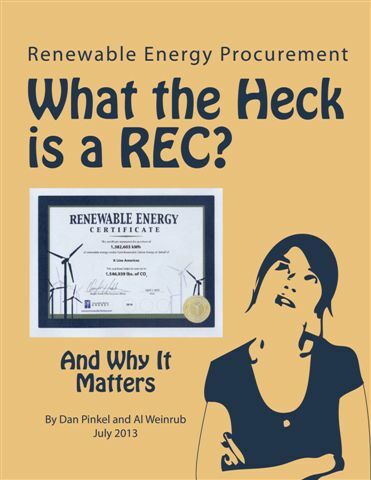 There is a great deal of confusion about RECs, and many misrepresentations about the nature and value of RECs in moving toward a renewable energy future. We hope that What the Heck is a REC? can help set the record straight on this important subject. This report is great. We keep confronting this question, and it's great to have something to put in people's hands. Kudos to LCEA for producing such a clear, comprehensive explanation of the arcane topic of RECs. At last activists, decision-makers, technologists, policy buffs and the general public have a booklet that answers their questions and helps advance the cause of clean, renewable energy in a more intelligent fashion. There is a lot of confusion about RECs and what they really mean. I struggled with how to interpret their alleged benefits until I read What the Heck is a REC? This paper is concise and clear, and a must read for those who care about renewable energy. I thought I understood REC's before I read What the Heck is a REC? Now I am more convinced than ever that we need a larger policy debate to strengthen those programs that truly encourage development of new renewable energy projects and to phase out those programs that make people feel good, but accomplish little else. What the Heck is a REC? is an important contribution to the debate. This report does a very good job of describing how REC's work…The explanation of bundling and unbundling is about as clear as anything else I've seen, and the whole booklet is a neat little job. This centers on issues in California, but it addresses issues that affect renewables everywhere. This publication is an impressive and very provocative analysis on the impact of RECs. This is such an important topic. We are very glad to have What the Heck is a REC? for its in-depth treatment. What the Heck is a REC? is useful to get a clear description of the difference between bundled and unbundled RECs, and their value in increasing renewable generation under various scenarios. Not all RECs have the same benefit in terms of encouraging additional renewable energy -- this paper will help you navigate the complexity and understand RECs better. Congrats to the Local Clean Energy Alliance and Al Weinrub for releasing this great resource on Renewable Energy Credits (RECs)! These RECs are slippery little creatures; just when I think I understand them I realize I don't. Yet they are the key to understanding just how honest your renewable energy is. Great reading for people who want to understand renewable energy! Thank you Local Clean Energy Alliance for putting this report together! There is so much false information out there it is good to have this broken down for novices! Wondering what the heck a REC is? Here's a great opportunity to learn more! Check out this comprehensive, informative document, and share widely! Download What the Heck is a REC? now!